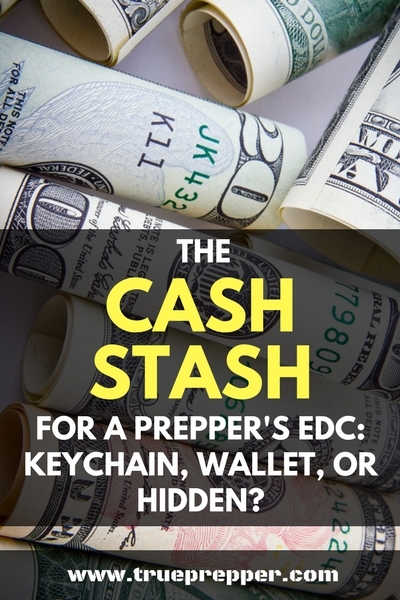 Stashing cash to carry with you every day may be the most important prep you ever do. If you don’t carry cash on you all the time, we strongly encourage you to do so. It should be one of the first things to consider when putting together an EDC (Everyday Carry) kit. In our plugged-in world we live in, fewer and fewer people are carrying physical money with them as they rely more and more on cards and phones for payment. Cash is king. 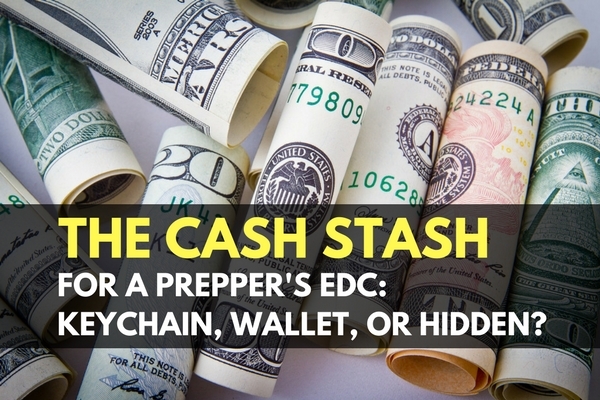 In emergencies, disasters, and SHTF, cash will be the way to get things done. Credit and debit is notoriously unreliable in these situations, and people are skeptical of taking checks or IOUs. Barter is always an option, but cash is much quicker and simple and will still retain some value unless a total societal collapse is going on. Getting people to take notice of you and go out of their way to help you will usually require something in return. This is where your hidden money reserve comes in. Whether you are using it for something as simple as food, or a cab ride in an emergency, or bribing and buying last minute resources in a SHTF situation, cash will come in handy. An emergency cash stash can get you home or to your bug out location, and keep you alive. If you do end up using it for any reason- be sure to replenish it as soon as possible. Pickpockets– Pickpockets in crowded urban areas target wallets stored in back pockets easily. One bump and grab and you are out of all of your cash resources. Family “Borrowing”– If your spouse or kids are anything like mine, what’s yours is theirs. My wallet often has fluctuating amounts of cash based on how much my wife needs. You Will Spend it Accidentally– You spend cash in your wallet. Unless you fold it up and tuck it away where you can’t accidentally spend it, it is probably going to get spent. Mugging – It is usually a good idea to surrender your wallet if you are being held up for it. The best answer is a CCP or a decoy wallet, but the worst answer is having your emergency cash in that wallet you have to hand over. A decoy wallet is an easy thing to use if you have room. Just be sure stash a few singles in there so it doesn’t make anyone angry. Lose It or Damage It – Getting your wallet wet, lost, torn apart, burnt… all these things happen! And they usually happen in an emergency which is exactly when you need your cash stash! Already Store Money Here – You already keep money in your wallet and it is a good idea to disperse your resources. That just means to keep your resources in different places, so if you lose one, you still have others. The military does this often with assets, like jet fighters, and it should be no different with your prepping gear. Well that list got long quick. The benefit of stashing cash in your wallet is that it is the easiest thing to do right now. Just fold up $20-$40 and tuck it into a flap of your wallet that you would only check in an emergency. That’s an easy way to get started, although you may want to consider a better solution and a higher dollar emergency fund down the road. The cash stash keychain is a gimmicky way to store cash, but it works. It checks the box of keeping your stash separate from your wallet, but it is attached to something that can also be targeted by mugging. Not to mention, people lose their keys more often than their wallets. Keeping your cash stash in a little tube on your keychain can also limit how many bills you can carry. Most people opt to carry a good amount of cash, with lower denomination bills mixed in. In emergencies and disasters, people you pay with cash either can’t or won’t be willing to make change for your big bills. Shoes/Boots/Socks – This is a good spot, but be weary of moisture and comfort issues. Putting bills under the lining of your insole is a very secure location, but be sure it doesn’t affect the support your boots provide. Hat Band – This is an option, but not the best. Many of us do not wear hats regularly, and a hat band is not the most secure spot unless you also use tape. It is susceptible to moisture unless you first but it in a bag. Interior Jacket/Pants Hidden Pocket – many jackets and some pants have hidden pockets these days. You may need to go with a tactical type of pant to find these pockets, but they can afford you some extra storage along with the hidden storage. TRU-SPEC and 5.11 are a few of the brands we prefer. Modified Clothing – You can cut your waistband or cuff to be able to slide bills inside. Depending on the fabric weight, it may be slightly visible though. Be sure not to forget about it when washing! Specialty Belt/Fanny Pack – Put away your neon one from the 80s- they make much more tactical solutions for body storage these days. Whether it is a belt meant for holding all sorts of stuff or a slim pack that straps around your waist, these are some of the most sophisticated solutions for bugging out or travel. Underwear – Storing money in your underwear may seem odd, but it works. They even make a disgusting looking Brief Safe knowing that thieves steer clear of unmentionables. Just make sure you seal cash in a bag to avoid moisture and odor issues. Keep as much cash on you for an emergency that makes sense and that you can afford. The cost of living and possible uses for cash is a lot higher in urban areas than in the country, so it may make sense to stash more if you live in a large city. Obviously, if you are carrying more it increases your risk of losing more, so you want to keep it secure. Also, if possible, you will want to store your cash in multiple locations. The ‘divide and conquer’ method will make it more likely that you will not lose all of your cash at once if something happens. Consider a ‘decoy wallet’ if you are traveling through areas where muggings are possible. If you want to start being prepared every day and everywhere you go, stash some cash. Whether you tuck it in your wallet or find a better way to keep it, you can know that you are more prepared than most. Encourage your family members to keep bills on them as well. Let us know your techniques for keeping cash on you in the comments section if you use a method we didn’t mention. You never know when you will need to pay somebody quickly, and a cash stash could very well save your life. Keep exploring, stay prepared, and be safe. Stash some behind your phone if you use a protective case. I do d that surprise usually when I get a new phone. That’s a pretty good spot since it is separate from your wallet, but still accessible. The only downside I see is that your phone could still be a mugging target.